Stretch marks are actually intradermal scars; in fact they are caused by ripping of healthy tissue and its replacement with modified cells. They can be of red, kind of blue or even light color. Usually stretch marks are caused only by few following reasons: sudden weight gain, pregnancy or hormonal changes. Deformation occurring in our body is negatively affecting the elasticity of the tissues which leads to the formation of multiple fractures, defects and thus affects all layers of the skin. By its nature stretch marks are perfectly safe for human health and only cause discomfort because of their unaesthetic appearance. There are plenty of methods how to get rid of stretch marks and we will investigate most common and most affordable of them. Well-known fact is that scars after giving a birth to the child or old scars are much more difficult to be erased. Here you need to use some special tools and homemade remedies will hardly help with that. In case you already tried all possible homemade remedies against stretch marks and failed getting rid of them you should try one of the procedures in the beauty salons. One more possible solution which now became popular all over the world is caller laser removal of stretch marks. This procedure is a combination of laser therapy with the injection technique. This method is the fastest way to get rid of stretch marks (even if they are old). You do not need to spend months using specialized creams or use under the skin special formulas as in mesotherapy. The result is noticeable after a week, but complete freedom from them occurs within six months. This procedure is suitable for all skin types. Laser method is possible to be used in any area of the body. The procedure is quick, painless and doesn’t require any recovery period. The laser provides a fragmentary or fractional removal of scar tissue and as a result the formation of new, healthy, young cells. During the course of treatment 50-70% of injured cells are replaced by healthy tissue. The color and relief of the skin after the course of treatment will return to the natural one. Infectious disease in the acute phase as well as any inflammatory diseases. Any of the disease in the area of the planned procedure. Antibiotics and medications to the photosensitizing effect. Predisposition to the formation of keloids. Treatment of the skin with any peelings or temperature procedures (tanning, solarium, etc.) at least 14 days prior to the procedure. The laser can guarantee to help us to get rid of fresh stretch marks. Unfortunately the old ones which we have for several years laser resurfacing does not remove completely but makes them almost invisible. Advice: Unfortunately plenty of salon procedures are painful and cost a lot so you should try homemade remedies before vising salon ones. Especially good is preventing of future scars. 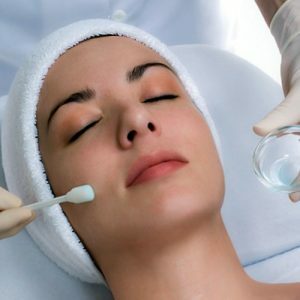 This procedure is based on the application of the specific acids on the affected skin areas. Acids are going deep into layers of the skin and dissolve scars together with stimulation of formation of new skin layer. Procedures for chemical peeling are carried out under the anesthesia. Materials used in this procedure are toxic for the body and may cause scarring. However there are benefits of this remedy and millions of people choose it. Peeling helps to equalize the surface of the skin and speeds up the process of formulating the collagen fibers deep under the skin. Peeling procedure is considered stressful but it helps to ensure that the mobilization of all the forces of the body is happening. After the peeling our skin is producing biological substances which promote skin renewal. The deeper will be the peeling procedure the more the body will experience stress the better impact on the appearance of the stretch marks we will get. They will become less noticeable. Peeling can be of two types: medium and superficial. During the superficial peeling the professional microdermabrasion machine with the ejected air flow is working together with finely divided sand. The skin becomes smoother and well-groomed. When medium peeling is happening cosmetologist is applying a variety of acids and they deeply penetrate into the epidermis. The type of the procedure can be only suggested after the careful examination of your case by cosmetician. They usually recommend the best possible procedure in each individual case. Type of chemical peeling is usually chosen depending on the depth and the number of stretch marks. Advice: Please be aware that for such a procedure there is a list of contraindications such as cardio – vascular disease in which the phenolic acids cannot be used. Scrub can be called a remedy which is most often used in the fight against scars of this nature. Scrub is exfoliating the top layer of the cells and makes surface smoother together with returning structure and color of skin. The elimination of the cells layer initiates active production of elastin and collagen. Under such a stress skin mobilizes the work of biologically active substances. The deeper scrub goes into the skin the faster it’s restructuring is happening. Mix equal proportions of salt and sugar. Add any vegetable oil. Olive oil preferably should be used for this recipe. Mix well and apply the mixture on the skin. With active massaging movements scrub properly the most problematic areas. Wash all particles of scrub off with the warm water. Repeat this remedy few times a week. The amount of procedures depends on the depth of the scars and your personal reaction to the remedy. Instead of salt and sugar use grinded coffee (coffee can be as freshly grinded and also that one which was used for coffee preparation). 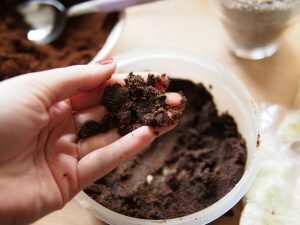 Mix grinded coffee with sour cream or vegetable oil. In case you do not have sour cream or oil at the moment you can just mix coffee with the shower gel. During 10 minutes massage problematic areas on the body with the scrub. After the procedure use some nourishing cream. Always make sure you washed off the coffee after the procedure. You should also pay attention to the skin reaction to the coffee. Some people have irritation or red skin after the scrub. In case of any inconveniences make a break and continue procedures in a week. Advice: Scrub will not hurt our skin but we should be very careful. We should not implement scrub every day. Scrub should be more gently used on the areas without scars. Massage is the most pleasant way to get rid of annoying scars. Unfortunately massage will hardly help with old scars but can provide incredible results when it comes to fresh scars or preventing them to appear. It is very important to make massage your regular and favorite procedure as removal of scars sometimes takes a lot of time. You can find professional and visit fancy salon with the pleasant professional beauty cosmetics. Use your favorite relaxing music while you are enjoying the procedure. Ask your loved ones to help you to get rid of the scars. They will definitely enjoy giving you massage as most problematic areas are usually breasts and stomach. It is enough to have 10 minutes of massage every day. You can divide the procedure into 2 rounds 5 minutes each. The most important to make the procedure pleasant and comfortable so you will be looking forward to have next one. Usually during massage we are using oils rich in vitamin E. This ingredient is providing firmness and elasticity to the skin. Orange oil and so on. Better than oils can be only special creams against stretch marks. Today the diversity is so huge that everyone can find one according to their taste and wallet. Massage is improving blood circulation and makes shorter the time we need to succeed in fighting with unaesthetic results of weight gain. Advice: Massage movements must be very careful and delicate without any possible stretching of the skin. Usually we do not know when to expect stretch marks to appear. The only moments we can make prognoses they will definitely appear is pregnancy or gaining weight quickly. Bath with various additives will not only reduce the overall look of gained weight but additionally will help us to get rid of annoying scars appearing on the skin gradually. Loosing extra kilos is additional bonus which can be obtained from this procedure. Dissolve in the warm bath sea salt and few drops of essential oils. Use ginger oil, chamomile oil, mandarin oil, rosewood oil or other oils which are good for you. Buy small collection of essential oils. During each procedure mix three types of oils. Add 2 drops of each kind and mix water properly. Essential oils can cause allergic reactions. Be careful with this remedy and only use it after allergy test. Dissolve few tablespoons of the sea salt in the warm bath (you can use sea salt packed separately per each procedure and you will be not measuring the amount every time). Add the same amount of baking soda and dissolve it in the water. Soak in bath for 10-15 minutes and rinse your body properly with warm shower. This remedy should not be used in case you have any wounds or scratches on the skin. Usually it is recommended to have a healing bath not more than 3 times a week. Such procedures should be regularly made. Treatment of stretch marks is very slow process and only our patience and persistence will help us to restore the original appearance of the skin. Advice: Skip hot bath remedy during the pregnancy. The overheating of the body during pregnancy is dangerous for the future baby and can cause risks. Consult with your doctor before implementing this remedy during the pregnancy. Remember that some of the essential oils in general are contraindicated for pregnant women because they can cause uterine contractions and bleeding. Provide decent physical activity to your body. Sport increases the elasticity of the skin in the best possible way. During the trainings formation of such unpleasant and unaesthetic symptoms are most likely far from happening. Eat properly. Provide your body with fruits and vegetables. Such food is full in vitamins. Sufficient amount of proteins will help in synthesis of collagen and elastin. Unfortunately sweet and starchy foods should be excluded from the diet. Do not exceed your optimal weight. Usually women do not notice how they gained first 10 kilos and then next 10 kilos and so on. As soon as you will notice first signs of gaining weight (plus 5 kilos is enough to react) use all your time and energy to lose those extra kilos. During pregnancy women are always gaining weight and that is normal. Unfortunately the weight gain is happening so quickly that our skin cannot properly stretch without causing scars. To avoid unpleasant picture on the breasts and stomach use supporting underwear. All recommendations you will obtain from your gynecologist. When you are choosing cream or lotion for your body check if it contains collagen and elastin. These ingredients are most important for our treatments. Cream is recommended to be used for every skin type after the bath or shower. At that moment our pores of the skin are widely open and they are reacting better to any therapy. You better use these rules in case first scars started to appear. As soon as you will start you will have at least slightest chances to win the war. Otherwise you will face unpleasant and painless procedures of stretch marks removals. ← How to get rid of warts on hands quickly and effectively. Dermelastic serum really does help with stretch marks and scars. I have a large scar that is beginning to lighten due to using this serum. I also have some areas with stretch marks that are fading. I would recommend this serum to any one.